I am Shrutin, and I’m a Design Strategist. I help companies in India and abroad pursue complex opportunities or solve complex problems; innovate and grow. 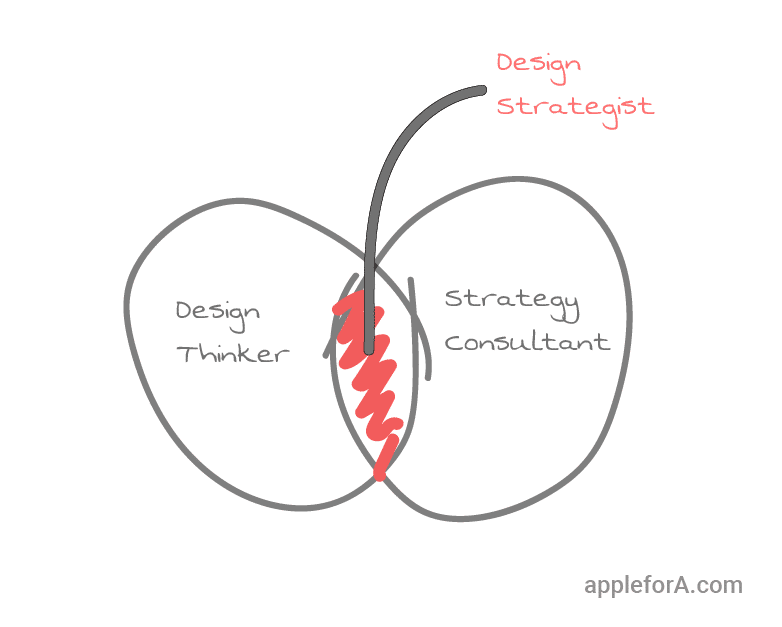 A Design Strategist is a combination of a ‘Design Thinker’ and a Strategist or Strategy Consultant. Strategy consultants aren’t usually creative. They use logic and research to help companies. Design Thinkers uses creativity, drawing inspiration from different sources, sketching, prototyping and many such fun things to find better ideas and solutions than strategy consultants usually can. Design Thinking is a methodology that focuses on understanding the end user better, to then innovate or solve problems. 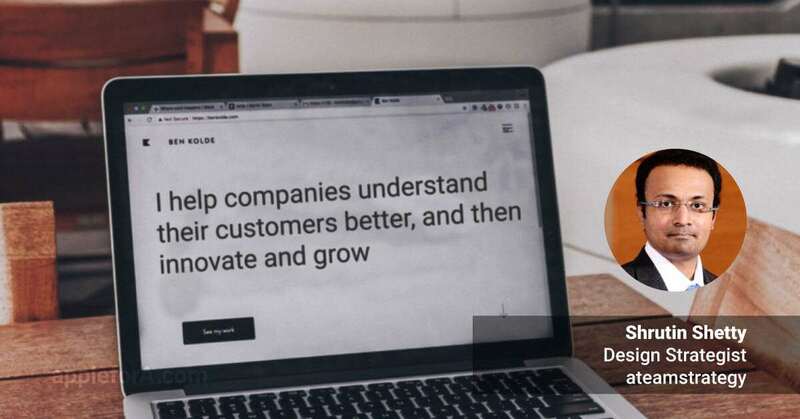 I help companies understand their customers better, and come up with ideas for more relevant products or services for their customers. In other cases, I help companies identify and solve complex problems. As a kid, I wanted to get into business (inspired by my grandfather, who had set up a restaurant business from scratch), or join the armed forces or possibly something of the Indian equivalent of the US Marines or Special Forces. Towards the end of school, I wanted to build robots and unmanned defence vehicles for the Indian army. I used to sketch what I felt they should look like and be capable of. Then I let relatives talk me out of it, saying supplying to the defence sector was near impossible. If I could go back in time I’d tell myself to listen to everyone, but regarding your career or your life, go with what feels right to you, however tough or seemingly impossible the path is, where your actions or decisions don’t harm anyone else. I’ve studied/worked in a diverse range of areas, before stumbling upon Design Thinking in 2015, when I decided to learn it via a distance program. Early in the course, I realized that the mindset and some tools were similar to the way I had been working for a long time, so in a way, Design Thinking came naturally to me. I went from Computer Engineering (which again, I was talked into, instead of my personal preference of Mechanical), to an MBA in Finance. Later I worked in Finance, Strategy, Marketing and little bits of Human Resources (recruiting, team management, etc. ), and now landed up in Design Thinking, with an increasing interest in cognitive psychology. For the last 5 years, I have been working almost independently, in my consulting practice. I have an external team of 6 people (ex-colleagues and bosses), whom I bring onto certain consulting assignments, based on their skill. Otherwise, I work directly with clients. My work is somewhat flexible. So I could either be attending new inquiry meetings or visiting and working at a client’s office on an ongoing project most of the time. At other times, I can operate from a co-working office, coffee shop or even from home. I occasionally conduct Design Thinking workshops. I also have 3 mentors, who guide me, and with whom I discuss different matters related to work. They also serve as a great source of inspiration for me, especially when work becomes challenging. My oldest mentor is around 84 years of age!! My career path wasn’t exactly a well-planned one. I just wanted to know and wanted to do the best at whatever I did. Things started working out during my MBA. I did my MBA initially opting for Marketing, but switching last minute to Finance, realizing it wasn’t as tough as I imagined. By then, I was also becoming increasingly clear about areas I was interested in, and those that were a complete no. Post MBA, I got into SIDBI Venture Capital, where, for over 4 years, I interacted with hundreds of entrepreneurs, discussing business ideas, working on investing in some of them, and helping businesses grow. As I wanted to work more closely with young startups, I quit my job, and became a freelance consultant for about 6 months, during which, I helped a few young companies identify more ways to grow faster and better. I then realized that I needed to learn more about how these companies worked on the inside, before I can truly be able to help them better. Therefore, I joined a technology manufacturing company, and was looking after their western India operations. These guys were in a fun space. They made equipment that helped car manufacturers measure and accurately make components that went into building a car. And they also offered robot automation solutions, where we would help companies completely automate a manufacturing process, with our robots lifting car components and assembling them, etc. Those robots were impressive! I had to do everything from hiring a new team, managing operations, marketing, overseeing service, etc. Then, I left to start my consulting practice. Focusing initially on Strategy consulting, I wanted to know more about Design Thinking. Therefore, I studied it, liked it, and shifted my consulting focus to Design Thinking, to help companies innovate. I wish I knew everything which has to be know before preparing for this role. But that’s impossible. The next best thing is, learn as much as you can, all the time. After getting out of a corporate job, you lose what you thought was your identity (how people identified and respected you). Till then, people recognize you by the company you work for. When you work for yourself, you need to build yourself a new identity that people will recognize. Because till then, people unknowingly assume that popularity and qualities of your company, are also your level of popularity and your qualities. Which is also why a lot of people want to join famous or big brand companies, even if their job in that company is irrelevant or meaningless to them. But that’s not something I can do. I’m learning new stuff every day. What advice you have for your younger self? Read more on random topics, interact more with people from completely different work backgrounds. When you read about areas different from your areas of interest or education, suddenly the two areas multiply and create numerous interconnected ideas and areas of possibilities in your head. The pay is not steady, but the growth in pay is wonderful. I get to choose clients I want to work with. In an assignment if there’s something that I feel is not right, like many company employees I am not compelled or pressurized to still go with it, if it’s wrong, don’t do it. The pay is unsteady. You could go months without a decent assignment, or be stuck in a situation where you haven’t had enough work, and a crappy assignment comes your way. More choices…. Avoid it because you can’t add much value, or take it up to fire up the income levels? You choose for yourself. Interestingly, during the initial days when income and savings are low, they teach you to live sparingly. And if you’re lucky, that mentality carries on when you have a little more. So you don’t feel the need to replace your mobile phone just because there’s a new one in the market. Or you don’t need a bigger TV just because all your colleagues or friends have one. You live simpler, and find more important things to do all the time, as opposed to binge watching Breaking Bad or GoT. What type of Design Strategists will be high in demand in the near future? Design Strategy being a combination of design, design thinking and strategy, will have immense demand and possibilities in times to come. This could be people and roles with multiple combinations of “design”, “design thinking” and “strategy”. With many left-brain, analytical jobs being steadily replaced by automation, it will still hopefully be a while before robots become good at understanding human (customer) needs and innovating to find newer products, services and experiences to offer them. Till then, design thinkers will be needed. I recently did an introductory course in psychology. Time permitting, I’d like to study more of it, to apply it to the work I do. Apart from that, who knows about tomorrow. Something else of interest, that might help me multiply the new with what I know, and open a million new possibilities. Life’s just too short to play or work cautiously. Give every interesting possibility a try. And even if you fail, you’d be learning far more than if you succeeded too early, only to spend the rest of your life repeating the same thing for fear of failing at something new. Joined a BPO – did dreadful night and early morning shifts for 6 months at Bangalore. Joined a technology company in the metrology, robotics and ERP space. I was General Manager for western India, operating from Pune as we catered primarily to the automobile industry. Started my own consulting practice. Been doing it since. I think every person and situation has something to offer and teach. Often, you forget the most wonderful school teachers, but you remember a horrible one or even a terrible boss. Why? Because they probably taught you more. Perhaps about how not to be. Being flexible to situations, open to learning, humble and patient with difficult people are among the basic things that help one learn and do well. How useful was the program from Darden School of Business? The Darden program helped give me a formal foundation to design thinking. The course itself wasn’t great, but learning the fundamentals is very essential in any area of interest. So it served that purpose well. Taught me the building blocks. After that, in most cases, I was on my own, to figure out and build on it. I just hope to improve the world a little bit. Great people of the past and present drive me. I’ve seen how little changes and improvements can make a huge difference in the long run. That’s all I hope to do. Try to make little changes, bring little improvements to the lives of people I connect with, to clients I work with. When I was an 18-year-old, I was a lot thinner and probably fitter, but also shockingly naive and clueless about many things then, especially the direction of my career, and how to get there. Today I am totally different from the person I was, probably you would have understood that with this interview. My career has been far too diverse to consider copying blindly. But if it’s a specific part of it you’d like to start with, be it an MBA in Finance or a career in Design Thinking, start with some homework. You can learn about anything online, or from books. Just pick up books or sites to read and know more about your fields of interest. See if you can associate or relate yourself with what you read. If it interests you or if you can see yourself doing something like it in the future, then read more about it. If it doesn’t work out, try something else and read more about that. What are some alternate career options for a Design Strategist? The future, and in fact, a lot of the present, isn’t about career options, but more about adaptability. I know people who spent 25 years in 1 industry/profession, before diving into 2-3 completely different things. Such people are somewhat rare, but even in a particular role, make sure you’re learning about other areas of interest to you. That way, you don’t have to wait to get fired or for your job to get boring. Therefore, you find the next interesting option that helps you grow, long before that. What do you think recruiters look for in a Design Strategist? Many of them look for past assignments/work in Design Thinking, and how it fits in with their way of doing things. Many are clueless about design thinking, but have a strong (and wrong) view on it. What I’d look for in a design strategist, is humility. When you get to a problem, and are not jumping at possible solutions right away, but rather curious to know more about the problem, and about the people facing the problem, that’s what makes a great design strategist. Because apart from the humility and empathy, all that’s left in design thinking is just a bunch of tools that anyone can learn and use. 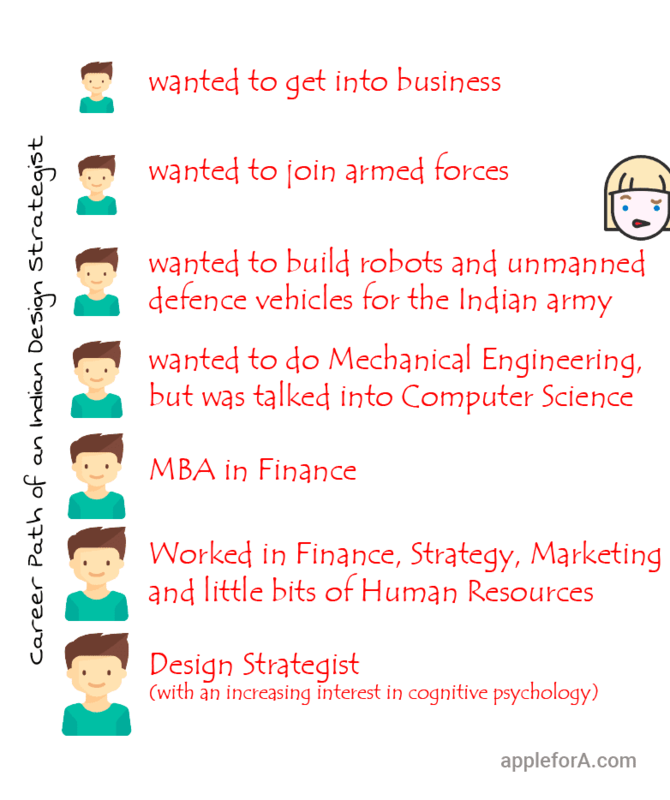 Who do you think should take up this Career choice? Ideally someone who is a right-brain (creative) thinker, or uses a mix of left and right with a little more right-brain. Because while logical thinkers can be taught to be creative and use their right-brain skills, it isn’t something that comes naturally to them, and would therefore be tough to sustain, especially without regular practice. (Not impossible, just tougher). Any recommended resources for students who are interested in this career? Tons of articles on Design Thinking are available as blogs, on LinkedIn, and on Twitter. You should put Google Alerts for articles on Design Thinking (or any other topic of interest). For Design Thinking, books by the Kelley brothers (IDEO founders – they helped design the first Apple mouse in the 1980s!!) and books by Tim Brown. Students should know that education and degrees aren’t everything. But at the same time, knowledge is very important. Try to work on understanding the fundamentals in anything you study, the basic building blocks. That will help you learn faster. This applies to any field. Is there something in your life that brings fear in you? Living a meaningless life that is wasted. Living a 9-5 job that I hate, only to wait for the weekend, before repeating the cycle. Dream of the impossible, and work your way to achieving it. All the best! You can read more real and inspiring (not really typical motivational stuff) career stories here.